The old antigravity claim is that by using an Asymmetrical Capacitor Thruster (lifters), levitation can be achieved. By applying charges using the aforementioned device, forces were measures to within +/- 100nN. Forces created this way are independent of polarity. Uniform magnetic fields have no effect on force. Geometrical variations in asymmetry caused little change in force. However, these results best match the coronal discharge effect. With this in mind, there have been some wild claims about complete control of gravitation over the last 80 years (such as those by Thomas Townsend Brown), although, most claims do not go that far. The Office of Naval Research (ONR) debunked Brown’s claim, (back in 1952) attributing effects to lunar tides. Without a 5th fundamental force, the measured changes must be dismissed as some known effect. Typical reports state a need for high (uncalibrated) voltage to achieve levitation. To verify these claims, an experiment was devised by the authors of this chapter (such experiments are rare). A lifer was constructed, and a test mass composed of Balsa wood was used. 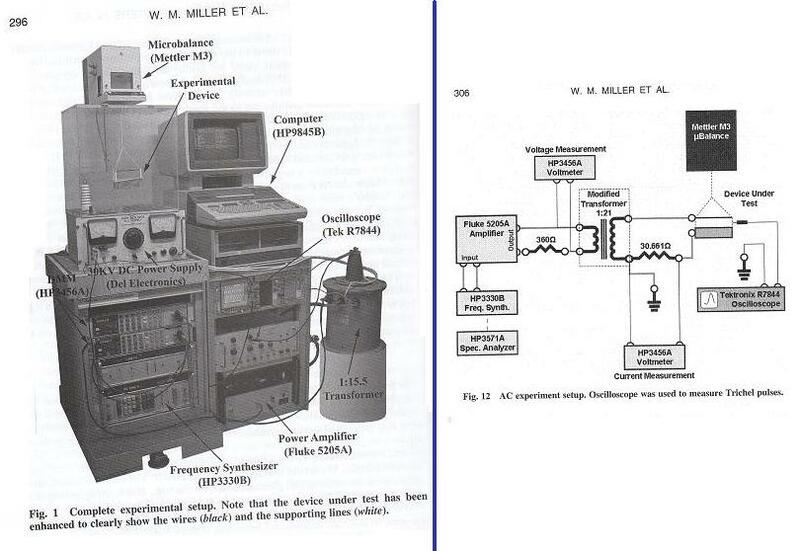 The procedure of this experiment is at the bottom of this page (will be attached later). Results from this experiment yielded a force that was proportional to applied current. Current was a requirement for the device to work. Because the ONR claimed coronal effects, the apparatus was coated in the second part of the experiment with a non-conducting material (glyptol). This greatly reduced the force measured for mid range results. For high and low voltages, not much change was observed, most likely due to “burn out” of the glyptol. Magnitude and direction of force was independent of excitation voltage. Force was not related to the gravitation field of Earth, but was solely related to geometry of the asymmetric capacitor, and always directed along the symmetry axis of that capacitor. Force exhibits a power law dependence with voltage (proportional to the square of the voltage) and current (force is proportional to current raised to 2/3 power). Current must flow for there to be force. Conclude the effect is a current flow phenomenon (not an electric field phenomenon). Sinusoidal excitation experiments were conducted. Canning thought that even with uniform voltages applied, leakage does not occur in a steady manner, but as pulses, implying that neither DC nor AC voltage in truly uniform. The presence of electrical forces was tested for under the uniform application of negative DC voltage. The apparatus was placed on a PVC stand with a probe positioned securely at a constant distance from the wire and plate. No noticeable results were observed until reaching 8.3kV. There were many components, but what matters here are the results. Trichel pulses were detected. They increased in frequency as more voltage was applied. But the odd thing was that the frequency could be very erratic. So force and voltage measurements were taken. Even with AC running through the device, the lifter can still generate force (AC or DC is irrelevant). Another test searched for geometric variations. This setup utilized two hollow, cylindrical plastic supports that were each 130mm tall. In the center of each lay an approximately 60mm plastic support tube that was positioned such that the support could rotate. This was placed on an aluminum plate, and wire would change distance from the plate. Results were taken. Generally, the shorter the wire, the more force. Force varied as voltage cubed, while force varied by the 2/3 power of current. For certain test points, there was a linear result. The authors dubbed three regimes for linear results. The “non-self-sustaining current regime” has voltages from low all the way to 6,000V. 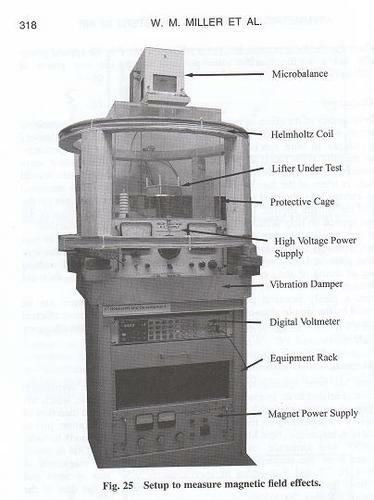 Next is the “corona discharge regime” which spans from 6,000v to 14,000V. Finally comes the “Fowler-Nordheim regime” which spans above 14,000V. It is noted that F=C √P appeared, where F is the force in µN, C is the constant (1 in units of µN/√µW), and P is the power in µW. Therefore, the force will be proportional to the length of the asymmetric capacitor. The change in force during the geometric experiments was small. Once again, only current mattered. There were no major problems with the experiment. More efficient generation of large currents with moderate voltages could improve efficiency. For the final experiment, magnetic fields were tested. The setup will be shown in a picture to be posted at the bottom of the page. To summarize, the magnetic fields are irrelevant to exerting force. Trichel pulses are formed when electrons leave plasma and attach to oxygen, forming a negative ion sheath. This sheath of plasma collapses at higher currents and caused instability resulting in periodic collapses, or Trichel pulses (first noticed at 6,000 V). They occur only for negative coronal discharge, but comparable forces exist for positive coronal discharge. A corona discharge in general is sustained by an avalanche of accelerated electrons propelled by high electric fields. There are second order effects that must be accounted for. This chapter also mentions quantum tunneling through Fowler-Nordheim tunneling (field emission). For this kind of tunneling, current passes through an insulating barrier (air for this experiment). Supposedly, according to page 16, quantum tunneling is unviable. Is the inclusion of this topic here again completely consistent with the earlier statement (earlier question)? Quantum tunneling naturally occurs in nature, where an object climbs a potential well that it could not classically overcome. On the macroscopic scale this is really not observed. An example of this is rolling a ball up a hill with almost enough energy to get to the other side. Classically the ball will come back, but quantum mechanically there is a finite (but very small) chance that the ball will appear on the other side of the hill a start rolling down. Returning to Fowler-Nordheim tunneling, there is an equation that can describe it. J = A(y)(E 2/Φ)exp[-B(y) Φ3/2/ E]; Here E is the electric field, Φ is the work function, J is the current density, and the functions are functions. Since the geometry is asymmetrical it is not possible to use the integral form of Gauss’ law once to get the electric field from the charge distribution. Lifters do indeed fly by creating unipolar ion current at the wire electrode. The air velocity of a device is proportional to the square root of the current. Lifters can produce this desired effect. A final note is that there are no special new forces created by lifters, as Tajmar proved.